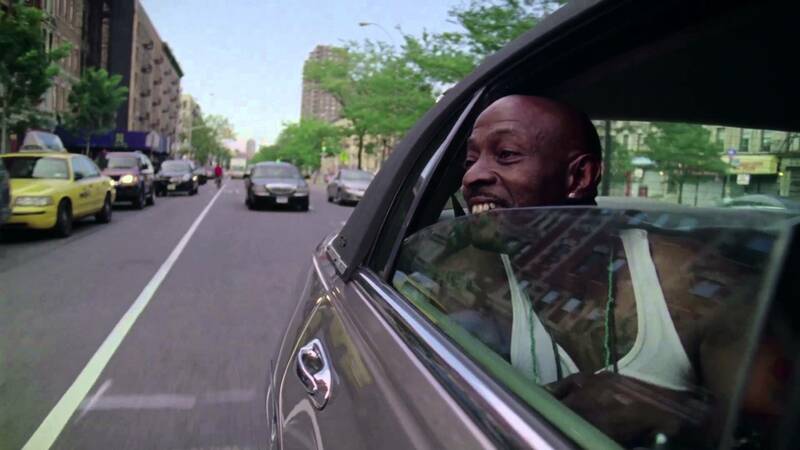 This February, Tate Modern is launching a strand of monthly artists’ film premieres called Artist Cinema, starting with the U.K. premiere of Ming of Harlem: Twenty One Storeys in the Air. Devised by artist, film-maker, and academic Phillip Warnell, Ming of Harlem looks at a 2003 incident in which a man called Antoine Yates was arrested for keeping a 425lb Bengal tiger and a seven-foot alligator for several years in his apartment in Harlem. 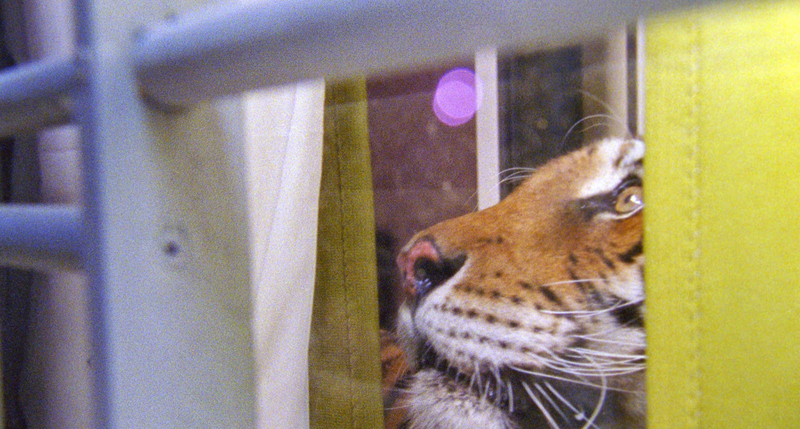 As well as taking Antoine back to his former neighbourhood and showing news footage of his dramatic arrest, the film depicts an imagined version of his apartment built within a tiger enclosure at the Isle of Wight Zoo, with the footage set to a poem by the philosopher Jean-Luc Nancy. Ahead of its upcoming Tate screening, Phillip spoke with us about his work on the film. How did you become interested in the story of Antoine Yates? It goes back quite a way. 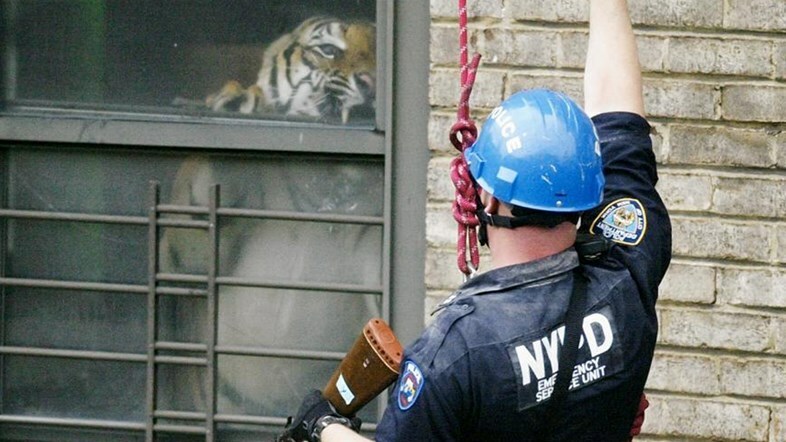 I saw it on the news in 2003, and it was just a very extraordinary thing to witness: a policeman rappelling down the side of a building being attacked by a tiger that’s inside. It all seemed so improbable that it just stayed in my mind, but at the time there was no way I could do anything with it. I like thinking beyond the news story: about former news, forgotten news. Ten years later I realised that it was possible to make approaches to people like Antoine. What was he like in person? People who have unexpectedly been part of the news, they’re often haunted by the moment at which their story became public. In Antoine’s case, there was outcry and public disbelief. Even the mayor of New York commented on it. Meeting him a decade after that, his recollection was still caught up in when it all happened, in an almost post-traumatic way. Was there any resistance on his part to talk about it, or was he quite willing to be the subject of your film? To his credit he was only interested in participating in something that was non-commercial, if I can put it that way. I think he would have been much more reluctant if the film were a commercially-driven proposition, but I told him that it was an artists’ project. I wasn’t making something on behalf of someone, and he was very open to the idea because of that. Where’s the boundary between an artists’ film and a documentary? You use archival footage to provide exposition and you follow Antoine around, but then the heart of the film is a long sequence showing a tiger move around a specially-built flat at a zoo. I don’t think there’s much to distinguish an artist’s film from a documentary, but I don’t worry about those definitions. I try to avoid thinking in terms of genre. Perhaps if one were looking for something that distinguished one from the other it might be that a documentary would be looking at reconstruction whereas this film slips into another domain, so it’s not a replica of the flat. It bears no resemblance whatsoever apart from one window. The rest of the flat I avoided becoming knowledgeable about. I wanted to imagine it, which drew out something that has very little to do with documentary. Did that make you feel like you had a free hand to let Antoine speak on camera, instead of feeling an impulse to challenge him on his point of view or what he did? Well, my view is that it’s not the role of a documentarian to simply challenge anyway. Sometimes in the presumption of challenging someone we simply get the perspective of the film-maker, so it’s not that I was avoiding challenging him, but rather that it would have been problematic in the first instance. I’m very interested in ambiguity and things that you can’t prove, things that are forever unknown. Unverifiable things. When someone says they did something and you can’t disprove it, there’s a wonder to that. Actually it’s something we all do in our own ways. When we look back we emphasise things and exercise preference. I love that we do that. The film includes a poem by the philosopher Jean-Luc Nancy. How did that collaboration come about? We’ve worked on several projects together. It’s our second film in terms of his involvement, but we’ve also collaborated on texts and some photo works. I’ve always been fascinated by Jean-Luc’s writing. It exists in the context of the reconfiguration of his own body. He’s a heart transplant recipient, and that has affected and contextualised his work. For this film I set him the challenge to write a poem about the bringing together of these rather at-odds species. Had he seen any of the footage you’d shot? No, he just knew the concept. If you show someone too much they can start illustrating it instead. I told him about the living circumstances of Antoine and the animals. I didn’t want him to write relative to the material, but relative to the idea of dangerous predators in limited space.